Peacefully at Belleville General Hospital on Monday, October 15th, 2018 in her 86th year. Beloved wife of John (Jack) Gifford. Loving sister of Doris Simpson (John Cotton). Dear sister-in-law of Barbara Stringer, Nancy Boyden and Joy Gifford. Predeceased by brothers-in-laws Gibb Simpson, Hector Gifford, Terry Gifford, Ralph Stringer, John Boyden and sister-in-law Barb Gifford. 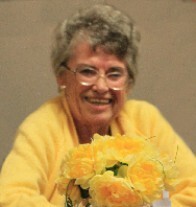 Jean is lovingly remembered by many nieces and nephews and great nieces and nephews. A memorial service will be held in Colborne United Church on Sunday, October 21st, 2018 at 2 pm. Interment in Colborne Union Cemetery. If desired donations may be made to a charity that is close to your heart. Condolences received at www.MacCoubrey.com.